Is the anything more enjoyable than bringing your family on a nice camping trip. The great outdoors, adventure, wandering through the forest on a sunny afternoon or just sitting by the campfire at night singing songs and telling the odd ghost story. Camping parks and camp sites today are so much better than they used to be. I can remember times when hiding behind a bush or tree stump was the toilet, Dishes were washed, well sort of washed in a basin of cold water and clothiers cleaned themselves after a few days of the kids dragging them in and out of the tent. There was no source of electricity – still not a bad thing with all the mobile phones, tablets and portable game consoles kids have these days. I have very fond memories of camping as a child and would not change one second of it. 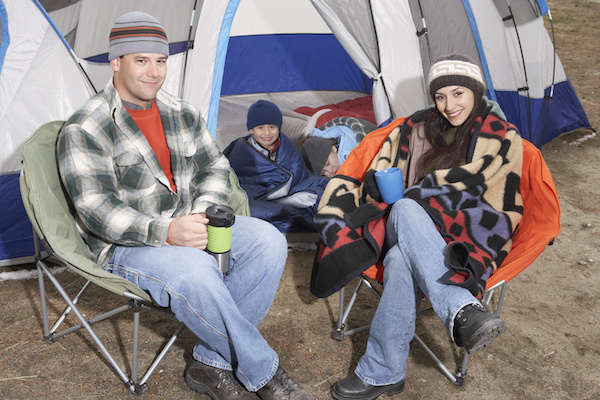 We love camping because it really is a great way to bond with your family. There is something about the fresh air and lack of charging points for the devices I mentioned above that brings everybody closer together for at least a few weeks of the year. If you are new to camping or seasoned campers then have a look at our guide below and see if there is anything you can take from it to make your next camping trip that bit more enjoyable. Comments are always welcome and any advice you can give us would be greatly appreciated. First up are the Kids. The first few days can be a bit of a nightmare sometimes until they settle down. Make sure that when you are booking your site that you check the proximity to entertainment areas. While being close to the camp kitchen and facilities are great there will be a certain amount of noises that comes with it. I love a good singalong at the best of times but when the wine mixes with a full day in the hot sun the singing can get a bit noisy and off key. A good nights sleep is more important for the kids that being close to the cooking area.. Most good campsites nowadays have babysitting facilities but be warned, you need to book these well in advance. You might not be going far but just to know that you have the option available if needed can make or break a holiday when you need some breathing space. I have seen time and time again cars parking up at a site and they are loaded up to the roof with tennis sets, scuba gear, canoes, kayaks and all sorts of games and entertainment for the kids. 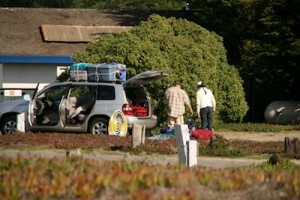 Most of the time it either gets unpacked and repacked twenty times because it is in the way or never leaves the car. 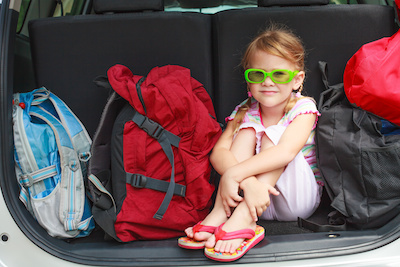 All good campsites will hold a stock of things to entertain the kids so ring ahead and check before you wedge the car full of stuff you will never use. I will always carry a good first aid kit with me when on a family camping trip. Most, if not all of the time it actually stays in the car but bring one nevertheless. Check the campsite once you get there and find out where their first aid office or hut is located. You won’t need it unless there is an emergency but familiarise yourself just anyway. Nothing worse that seeing somebody running frantically around a campsite looking for medical aid and having no idea where to go. I will be signposted but again, check it out for peace of mind. Location of local doctor etc will be posted on the camp website so read that as well. I love to cook when I am camping and actually put a fair bit of thought and planning into this well before we set off in the car. The reason behind this is so I can stock up in advance on supplies I need for the duration of our stay. It also saes the shock of the huge grocery bill the day before you go on holidays. For some trips I may even write out a rough menu for each day. This might seem over the top but it really helps with the planning and saves on waste. You can pre-cook a few of the meals and have them to hand for the first couple of days on camp. I have seen people freeze pancake batter and stick it in piping bags. A great surprise for the kids is having pancakes for breakfast – not the healthiest option but great all the same. I always pack plenty of fresh fruit on each trip. You can stock up on some of this and it will last the whole trip. It is really healthy for the kids and will be a welcome change for everybody. Plus buying in advance will be much cheaper that purchasing on site or from the local store. Another thing worth checking out is if there is a kids club on the site. This can be a great distraction for the kids and they will meet and bond with new friends every summer. It also gives them a sense of independence and builds character over time. The other advantage of a kids club is it gives mum and dad a chance to catch up and just relax for a while. Read a book or just chat, whatever you do enjoy the peace and quiet anyway. Check with the club if they feed the kids at lunchtime and also take note of how many kids there are to each staff member. Staff will always do their best but if they have too many kids to mind they can get overrun and things start to happen. Always go with your kids the first day or so and drop them off. That way you can briefly get to know the staff and fill the kids in on exactly what is going on. Explain the rules a few times and leave it at that. 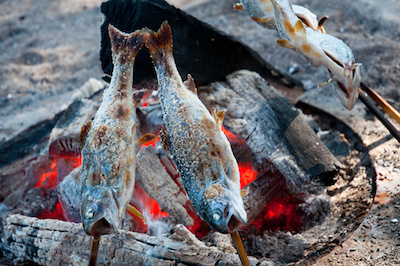 Dinner time for me on a camping trip can mean many things – it just depends where you are. High end campsites will have every imaginable cooking requirement covered off for you but if you are ‘in the wild’ you may have to rough it a bit. 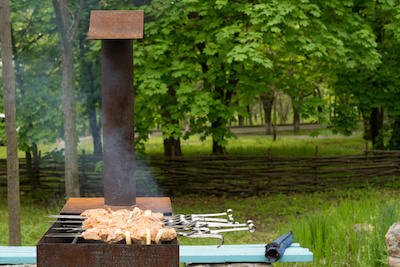 This for me is the best form of camping – lighting a camp fire and cooking over it. I could write all day on fire safety and cooking tips for a camping fire but will cover those off in separate posts at a later date. Either way dinner will be a breeze because if you are still reading this you will remember from earlier that a bit of planning pre trip means you have everything planned out for meal time. Bring something that can be roasted on the fire for dessert and the kids will love you for it – remember you are camping and not on the moon so some creature comforts are allowed. At bedtime things can always go a bit pear shaped. Kids are used to their comfortable beds and familiar surroundings. The first few days can be a bit of a challenge but after that they will be so tired from running around all day at kids club or adventures with dad in the forest that they will fall into bed. I like to bring things like proper pillows for the kids and maybe even throw a few duvets into the car. Sleeping bags are great but duvets are so much better. Pack a small camping light for each of the kids and don’t forget teddy if he still features in their bedtime routine. Try to get them in the habit of going to the toilet before bed – seems like a normal thing to do but when camping schedules and habits go out the window. It will save you roaming around the campsite with a terrified kid in the middle of the night looking for the toilet armed only with a flashlight with worn out batteries. If you have a family pet such as a dog then you will need to make sure the campsite you book is animal friendly. You can buy camping dog kennels these days that are perfect for the trip. Chances are the dog will end up in one of the tents with the kids but no harm in having one if you feel the need. Make sure you follow the camp site rules regarding animals and please always clean up after you pet. Your kids and plenty of other young kids are running around so you don’t want any nasty accidents. If you cannot bring your family pet with you then let the kids know well in advance so they can get used to the though of being without them for a few weeks. Let pet minders know and book them in plenty of time in case they let you down. Camping is great fun for all the family and if you do a bit of planning it can be even better. Do a bit of research into the surrounding area. Let Dad take the kids on a wild adventure into the forest and show them some of his camping and survival expertise. How to light a fire without matches – make sure it is in a safe area and permitted. Catch a fish from a fresh stream or river. Even better if Dad then cooks it for supper over an open fire that he lit with a flint and some twigs. The pace on a camping trip should be relaxed and easy going. The whole idea is to escape into the wild and have a break from the 9 to 5 daily grind. Nothing is done in a rush and you need to remember that. It takes me a few days to unwind when I arrive but after that it is pure bliss. I spend far too much time working so when I go camping its family time. Kids first then everybody else second. We have another post on the Top Ten Tips for camping with kids that you should check out. It will give you a few great ideas to keep them entertained and wow them with your expert urban survival skills. I also try an unplug from everything electronic while I am away and encourage the kids to do the same. You will get a bit of push back at the start but stick to your rules and things will work out. I bring a mobile phone for emergencies but turn off email otherwise I would be tapping away all day. There is so much to do outdoors and you and the kids will miss out if you are glued to your phone, tablet or games console. Teach the kids some old bushcraft tricks or how to forage for food in the wild. Make sure you know what to look for yourself before you start giving advice but it will give them a sense of reality when they find that we could all live without processed and canned food if we had to. The final point I want to make here is to have fun. and lots of it. You will create memories that will last a lifetime so enjoy every second of it. We would love to hear your camping stories and things you do to make things more enjoyable while at the campsite or out in the wild. We are by no means experts, we just love camping and want to share what we have learnt over the years in the great outdoors. We will recommend camping equipment in some of our posts but thats because we have either used it and can recommend it or because one of our readers has done similar and its a must have when camping. We hope you will leave a comment here and share some of your thoughts on camping and what you do when you head out. Thanks for stopping by and see you around the campfire.